In the article vPC aka Virtual PortChannel, I explained how vPC works and the benefits that it gives. However, there is another important feature using HSRP/VRRP protocols in the context of vPC: the Layer2 dual–active peer devices. 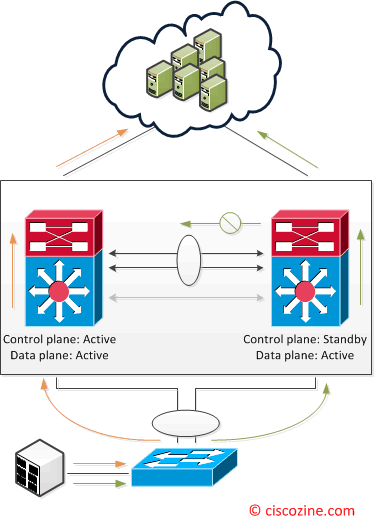 HSRP and VRRP operate in active-active mode from data plane standpoint, as opposed to classical active/standby implementation with STP based network. From a control plane standpoint, active-standby mode still applies for HSRP/VRRP in context of vPC. 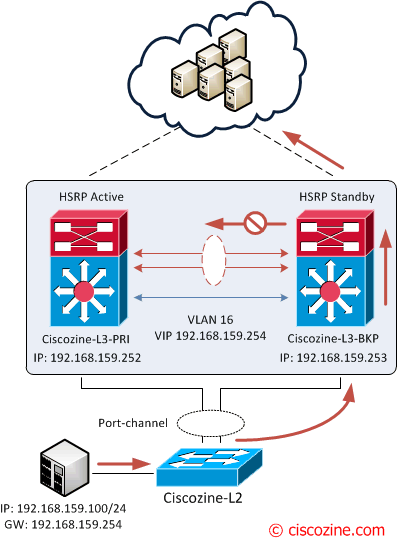 A characteristic of the active HSRP/VRRP peer device is that it is the only one to respond to ARP requests for HSRP/VRRP VIP (Virtual IP). 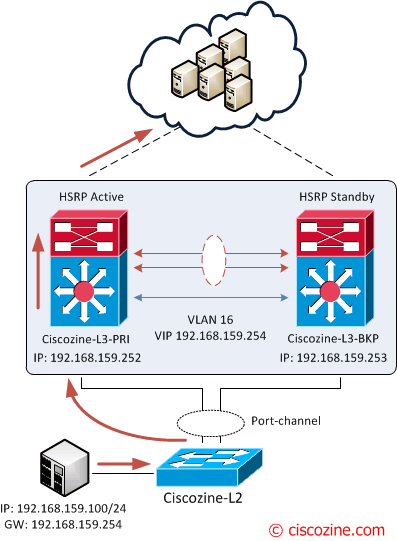 ARP response will contain the HSRP/VRRP vMAC which is the same on both vPC peer devices. Note: No additional configuration is required to enable active/active HSRP/VRRP. Suppose to have 1 Nexus5K (Ciscozine-L2) conntected to 2 Nexus7K (Ciscozine-L3-PRI and Ciscozine-L3-BKP). 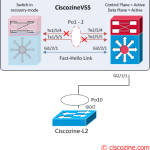 The Layer3 is defined on the Nexus pair (192.168.159.0/24) and the Active HSRP is Ciscozine-L3_PRI. 1. The packet reaches Ciscozine-L3-PRI (the active HSRP), than it is forwarded to the cloud. Note: the “0000.0c07.ac10” is the vlan16 virtual mac address. 2. The packet reaches Ciscozine-L3-BKP (the standby HSRP), than it is forwarded to the cloud! Why does the packet received by the Ciscozine-L3-BKP is sent to the cloud and not to the virtual-link? This is implemented by imposing the G bit in the MAC address table (thanks to the vPC feature), that indicates that this traffic is meant to be routed. This is the reason why the HSRP with vPC works as active/active! Note: The same behaviour occurs using VRRP.